Installation Pictures Page | This page is just a friendly help if you want to install your own heater. Any questions, call us. For your convenience, we have taken pictures of miscellaneous installations. Be sure to follow all applicable codes for fire, electrical, and exhaust etc., which may differ from these pictures. Also refer to your owner's manual. We also recommend that you get a licensed, experienced, professional to safely install / inspect the furnace installation. Use at your own risk. 200 Black Gold heats the shop through the wall (on the left). 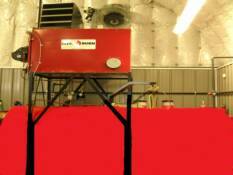 This is the second furnace in the international truck shop. Notice the stack goes out the wall on the left side. It sets on top of the concrete office. The clean-out cap is on the bottom right. 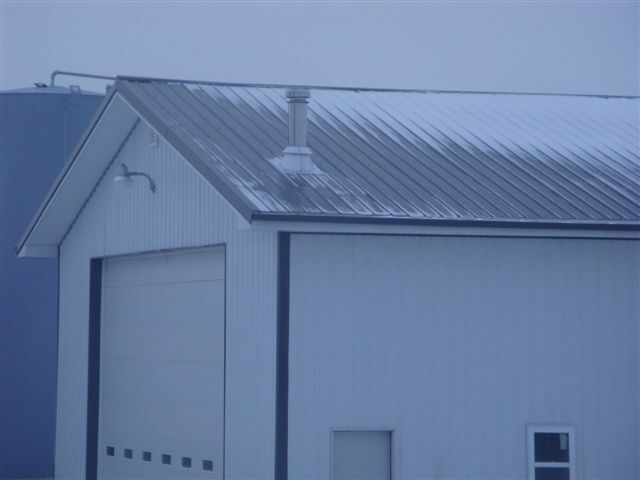 Watch out for other roof lines in the vicinity of the exhaust cap, to eliminate down-draft. The first 3 pictures are an outside view of the international dealer. Class A stack was cemented through the block wall; they did a beautiful job, and it works great. Notice the clean-out plug on bottom of the tee. 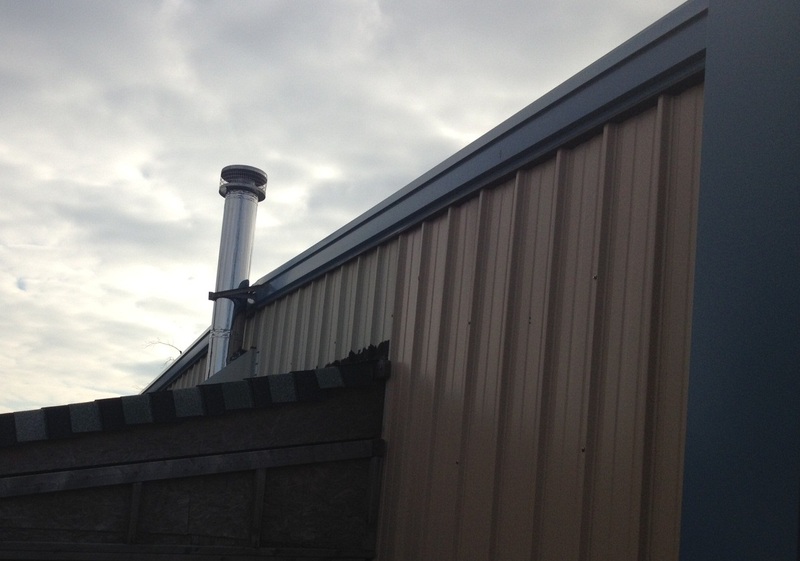 This stack sets above the roof line properly, but has no where to clean out the ash from the elbow. 300 gallon tank with furnace bracket on top, to set heater in. Beautiful installation, and it is easy to clean and service. Inside stack on top of Black Gold heater. Be sure to keep triple wall 1' underneath ceiling, and use bracket to prevent it from falling down. This stack looks great, except, notice the ridges on the upper side of the stack. The two ridges above the stack will make a pond of water when it rains. The stack should have been centered with a rib in the tin, causing the water to run around the stack. Think about snow when you install your stack. (Looks like the snow bent the first chimney over.) Keep an eye on your roof and stack outside. The second stack could get covered with snow. It is barely through the roof, and could freeze shut, and close the stack off. This is a basic picture of a meter pump, installed on top of a tank. It is very simple. Save your oil in the summer time. You will need it when it gets 10° below zero! Don't give it to your neighbor. An outside tank can work very well if it is done properly. Be sure to use UL listed, code approved tank, with proper venting for outside storage. 350,000 BTU Shenandoah Ceiling-hung, with heavy angle-iron, on steel beams. It was a great job, except it was too close to the flammable ceiling. Minimum distance must be 3'. Also, the stack was not supported. If it would rust in two, the whole stack would come down through the ceiling, and fall down on the floor. 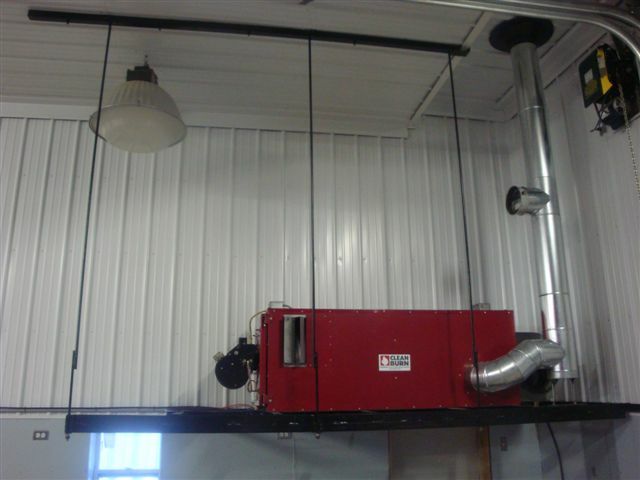 This one heater heats a huge logging equip/ truck shop, and it runs great. Notice their stack outside in the next picture. This stack is leaning, because it did not have a bracket to hold it straight. The guy wires rusted off. Notice how far the stack sticks above the roof. This stack will work great. Notice the buildings and roof lines in the near vicinity (above, behind, and below). Taller stack may be necessary in such installations. A great job! The stack does not need to be higher than the peak, just protruding nicely through the roof, to avoid down draft. If possible, avoid the extra expense of using triple wall, through the tallest part of the trusses. Model 2500 with the easy clean out door open. 1. We make satisfied customers a priority. 2. We have the best value. 3. We do what we say we're going to do, within an agreed timeframe. Nice install in a new shop, but it may be too close on the left side for clean out panel access. Can the bottom cap be removed to clean ash out of upright stack? MODEL 2500 CLEAN BURN; happy customer. 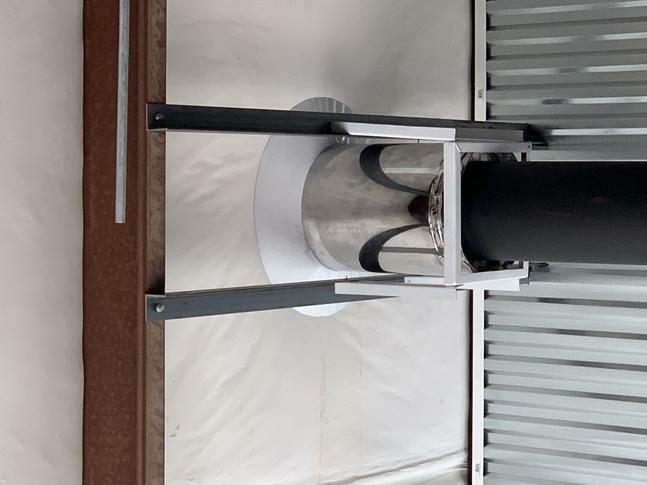 The 8" triple wall goes straight up through the ceiling & roof sheet metals; just two holes & a bracket needed to hold triple wall near the ceiling. Imagine the backdraft with a west winter wind. Notice the square tube on ceiling that mounts heater on a diagonal angle. It's a big 4 and catches two trusses. Four 5/8 inch threaded rods go down to heater. Too many flammables in vicinity of heater; even a tree branch shot down through the roof from a tall tree outside! Use common sense!!!!! This after market oil recycling center (workbench tank) holds 330 gallons, and is 8' high. We can mount any reconditioned heater on top of these tanks. It includes emergency vent, pump mounted & wired, fill hole, and water drain in bottom etc. This option makes installation easy for you. Call us; we're flexible. This is an 8" Metal-Fab, stainless stack system for outside the building. It has a 90° brace, and is fastened to the building. This is all the same stack system, just different views. 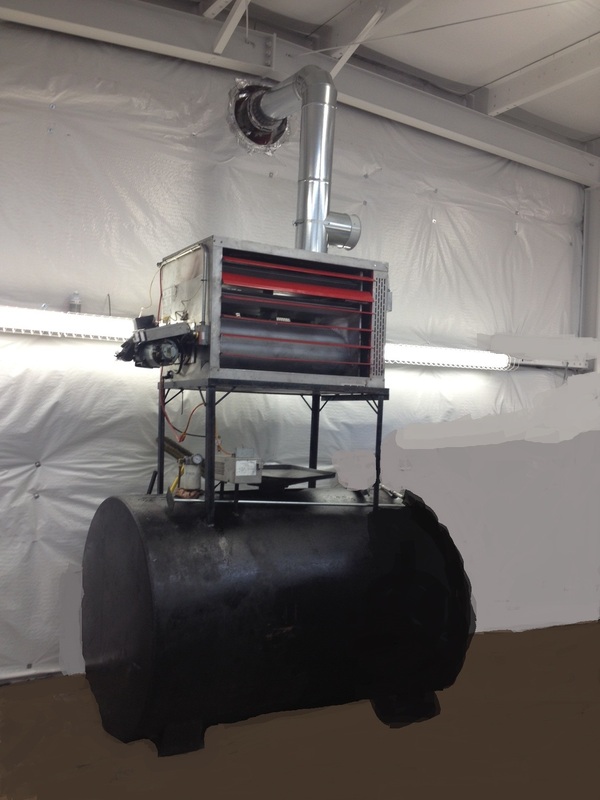 This is a 125,000 BTU heater mounted on top of 275-gallon tank. Don't mount your heater directly on top of your tank. You should have more room for fire safety. 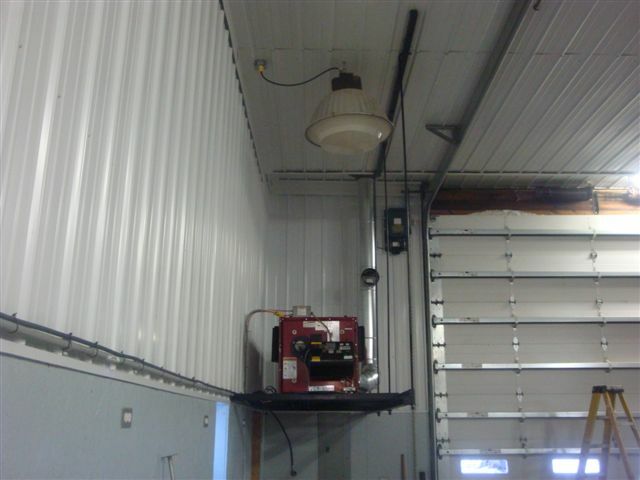 This heater was in the corner of a small garage, blowing on an angle. It heats the whole shop nicely. 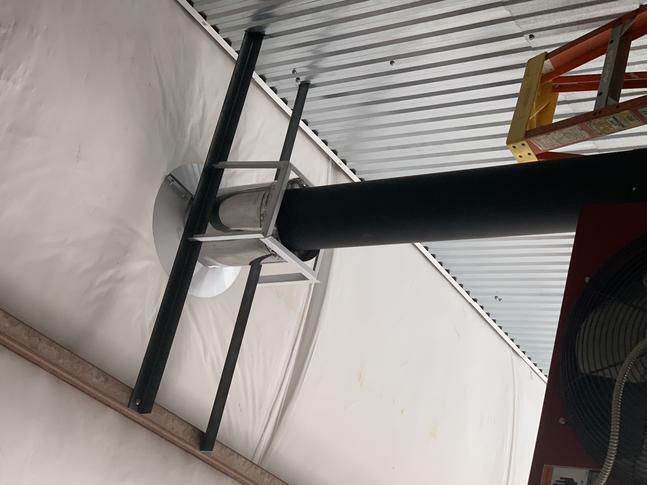 If you need your furnace mounted in a specific position, or on top of your tank etc., we can fabricate any style or size mounting bracket, for a perfect fit in your shop. You are responsible for the oil you generate, summer and winter. Don't let them haul it to your neighbor; you will need it when it gets cold. Did you know that if they spill it, you are responsible for the clean up? 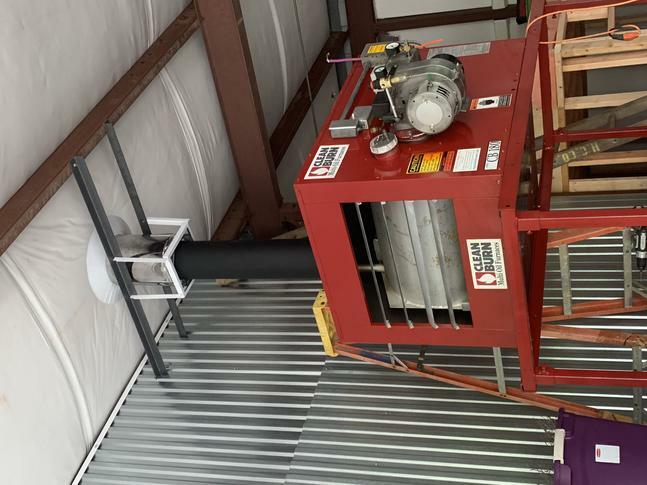 New Metal-Fab Stack System Click here for stack system information to go with your furnace purchase. Call us for the password needed on the next page. 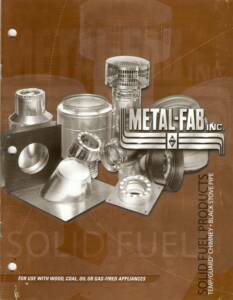 Click on the image above to get the Metal-Fab stack system information. You will need to call us for the password. Powerful, 8 HP gas with love-joy coupling and big gear pump. It moves 250 gallons in 20 minutes. An installation in the mountains of Colorado. 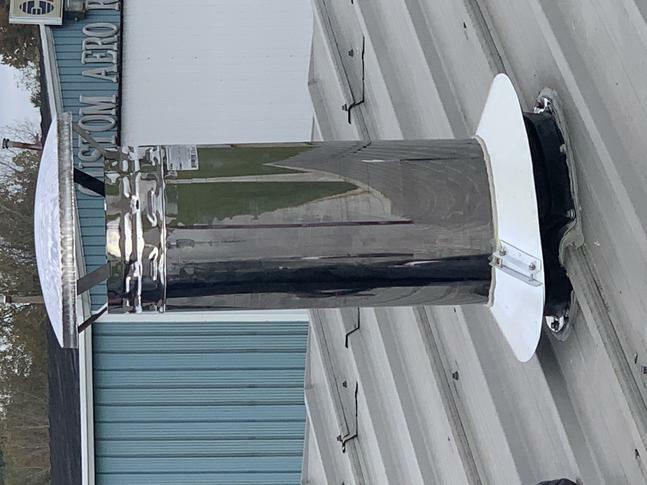 We shipped the furnace to him, he installed it, and it works perfect , even at high altitudes. He did a nice job; we would suggest cutting the insulation 2" away from the stack. He likes it. Simple installation. 90° on the heater, then straight up through to the rain cap. The 4 allthread rods should go through the ceiling and fasten through a 3" square tube on 2 or 3 trusses. This stack goes in through the wall to the 250 Omni, shown in the second picture, using an insulated T to come through the wall. Then the 8" triple wall goes straight up outside, higher than the end wall. This eliminates down drafts. 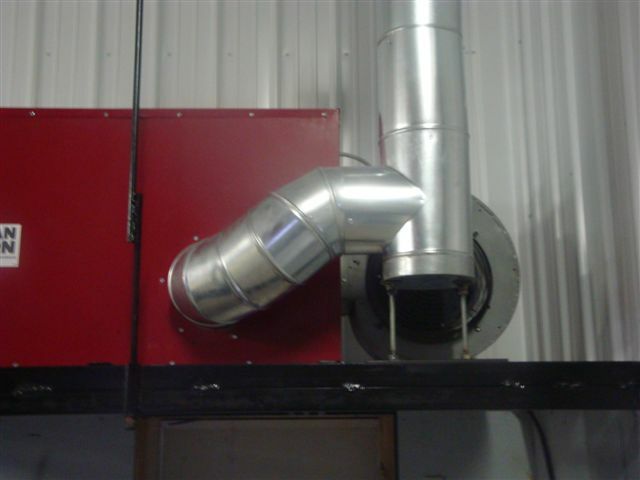 The inside stack can be lifted up slightly above the heater, to remove and clean it. A super installation. stack mounting pix in a steel frame building they made a small angle iron frame to fasten it up to the perlins.